Our rating: five LAVA® motion lamps. Here's a story Hollywood doesn't tackle nearly often enough: The touching tale of a young girl and the larva she loves. Nausicaa of the Valley of the Wind was Hayao Miyazaki's first chance to direct a film featuring his own characters, and he used that chance to fashion a fantasy world so complex and believable that it could be compared easily to the worlds of J.R.R. Tolkien and George Lucas. Like Tolkien and Lucas (and sadly, unlike most of their imitators), Miyazaki had the talent and the imagination to use his fantastic world as a setting for a compelling story populated by strong characters. Nausicaa takes place in a post-apocalyptic future 1000 years after a catyclysm has forced mankind to live around the fringes of a great forest of huge poison fungi known as the Sea of Corruption. (Or alternately, Florida.) Most of the story is set in the Valley of the Wind, a place made relatively safe from the forest's virulent spores by a constant sea breeze that is channeled and amplified by the valley's high walls. The Valley's residents have created a little agrarian niche for themselves, largely ignorant of what goes on in the outer world. So that's where Mentos come from! Unfortunately, war has broken out between two of the world's remaining empires, the Torumekians and the Pejite, over an ancient and powerfully destructive weapon called a God Soldier. Explaining the Soldier's origin would spoil a bit too much, but neither side trusts the other to have it. A ship transporting the weapon crashes in the Valley, so when the conflict breaks out, the Valley's inhabitants are caught in the middle. Central to all of this is Nausicaa, princess of the Valley of the Wind. She's smart, strong, and she has an unusual empathy with nature. Nausicaa dominates the movie, and she dominated the world of Japanese animation for many years after the film's release. Periodic polls of the readers of Animage magazine (a Japanese publication devoted to anime) consistently placed Nausicaa at the top of the list of most popular female characters until 1990, when she was dethroned by Nadia from Nadia: Secret of the Blue Water. As Nadia is not much more than an amalgam of Nausicaa and Sheeta from Miyazaki's Laputa: Castle in the Sky, it is safe to say that Nausicaa's influence was still felt. This is what "Project Ginger"
In an early scene we see Nausicaa use her powered glider Mehve to rescue a traveler who is chased from the fungi forest by an ohmu. An ohmu is a huge insect, about the size and shape of the Sydney Opera House, but uglier. Rather than trying to destroy it, Nausicaa calms the insect and leads it back to the forest. 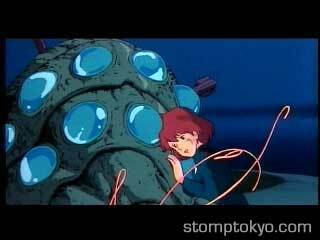 Nausicaa's insistence that mankind must try to co-exist with nature (however hideous) rather than try to defeat it is the predominant aspect of her personality, and that idea is also one of the movie's central themes. When she was a child Nausicaa harbored an Ohmu larva secretly, and her realization that the insects aren't inherently dangerous leads her to some startling revelations about the Sea of Corruption in her adulthood. 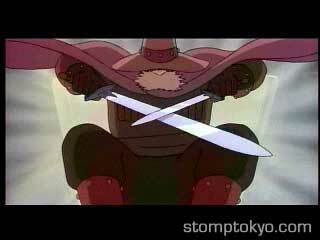 After the Valley is occupied by the Torumekians, Nausicaa and three of her people are taken hostage by a princess of that empire, Kushana. But on the way back to Torumekia Kushana's aerial convoy is attacked by a Pijite gunship, and Nausicaa, Princess Kushana and the hostages end up stranded in the Sea of Corruption. 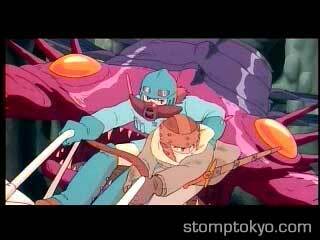 Nausicaa also saves the pilot of the Pijite gunship, who was immediately shot down by the last of Kushana's ships. That pilot, Prince Asbel, mostly made us wonder if these empires just have such large royal families that no one of lower rank than a duke goes into battle. Nausicaa and Asbel end up trapped in the depths of the forest and a kind of romance develops between them. But the movie has a bigger agenda than that, and the movie climaxes in events that determine the fate of the Valley. Don't make fun of his moustache! As one might expect from a movie with the word "wind" in the title, much of the film takes place in the air. Although most of the world's technology has been reduced to the level of the early Iron Age (the Valley's residents use a lot of windmills), there are still huge and fantastic flying machines left over from the pre-war civilization. 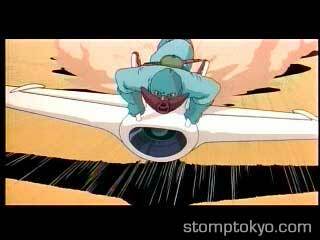 The film's most exciting sequences involve aerial battles between the various factions. Miyazaki also outdoes himself with the variety of giant insects. There are giant dragonflies, giant beetles, and even giant doodlebugs. The ohmu are featured most prominently, and the adult versions look like armor-plated Mothra larvae, though they never fraternize with singing twins or spin cocoons. And it's to Miyazaki's credit that he actually manages to make the young ohmu cute, in a chitinous sort of way. As of this writing, this classic of animation is not available in the US, unless you want to track down Warriors of the Wind, a heavily edited version of the movie that was released on tape in 1985 with one of the more puzzling covers ever slapped on a movie. If you haven't seen it, it implies that the hero of the film is some guy who looks like Patrick Swayze in Steel Dawn, and his sidekicks are an android and an alien with a lightsaber. (The last of those is based on some flashbacks of the God Warriors.) These three are riding a monster based on the final appearance of a God Warrior, and flying above this scene is a boy on a Pegasus and finally, small in the upper right hand corner is Nausicaa on her glider. Disney currently owns the worldwide video rights to this film, but as yet we haven't heard about any release of this stateside, though it remains a possibility after the probable DVD releases of Castle in the Sky and Kiki's Delivery Service next year. 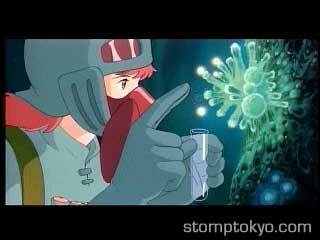 If you need a Nausicaa fix you can always read Miyazaki's manga, from which the movie was adapted. It tells a much more expansive version of the story, and explains many things that the briefer narrative of the movie glosses over. New in 2002, the VW UberBeetle! What struck us most in our first viewing of the film since seeing the magnificent Princess Mononoke is that Nausicaa and Mononoke are essentially the same story, with many similar themes and sequences. 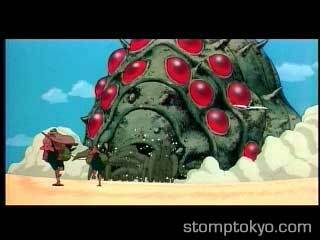 (Compare Ashitaka's initial encounter with the Tatarigami in Mononoke to the scene in which Nausicaa calms the ohmu for just one example.) Mononoke is more complex, certainly, but it is particularly fascinating to watch such an accomplished storyteller spin different tales from the same essential material. Whether Miyazaki grew more optimistic in the intervening thirteen years is subject to some debate, but we found it satisfying to discover that Hayao Miyazaki's modern works enrich his earlier films rather than simply making them look dated. Can you think of a grander legacy for a director to leave to the moviegoing world? This review is a part of the B-Masters Big Bugs Roundtable!